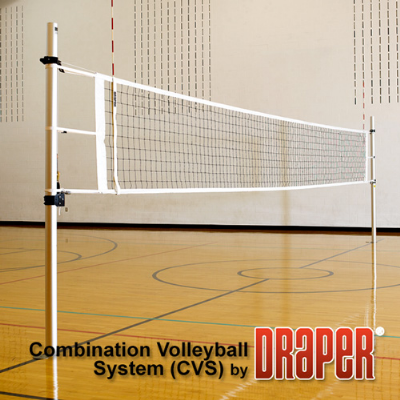 CVS Combination Volleyball System incorporates all of the top quality features of our high end system with additional versatility. The all-aluminum CVS floor-sleeve type system adjusts to all competition heights for tennis, badminton and volleyball or anywhere in between. Fixed Length Aluminum Standards — One pair of uprights. A power winch is located on the inside of one post. The second upright is equipped with an adjustable cable anchor collar. Fixed Length Aluminum Standards - one pair of uprights, A power winch is located on the inside of one post. The second upright is equipped with an adjustable cable anchor collar.